Sellsy Retail allows you to easily manage the return of items. The options window appears, click Back and OK.
To handle the return two cases are possible. If the amount of sales exceeds the return: the return is simply deducted from the total and you can record the remaining payment. 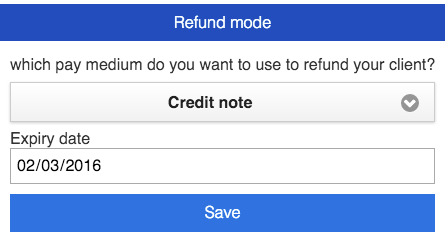 You then specify the method of refund. The system displays the amount you have to repay. A credit note is a negative receipt usable for the client in a given period. Choose an expiry date and validate. The credit note is created and the ticket is printed. You can then give it to your client.